/ What Does A Hardwood Conservatory Cost? 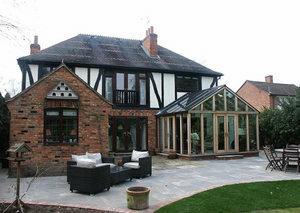 One of the most frequently asked questions we get is ‘what does a hardwood conservatory cost?’ The simple answer is it depends on several factors such as the size of the conservatory itself, the finish, property-specific requirements and the overall goal of why you’re looking to have a hardwood conservatory extension built. In this post, I’ll be explaining the different factors which can impact your investment into a glazed extension. 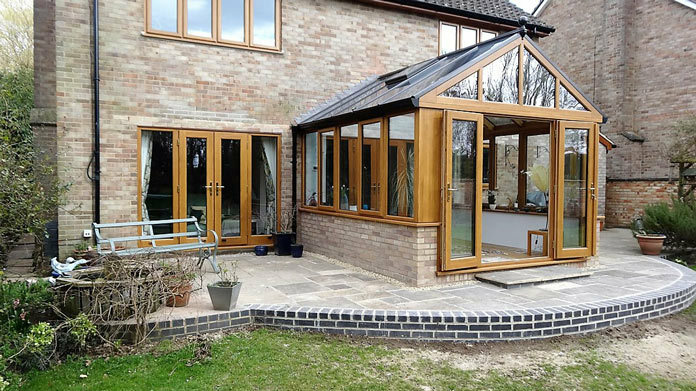 I say investment because while you need to understand how to budget for your extension, it’s important to remember that any modern oak conservatory, hardwood orangery, wooden garden room or any other type of timber glazed extension will immediately increase the value of your home. All of the conservatories and glazed extensions we build for our clients are completely bespoke – so no two wooden conservatories are ever the same. And this means the cost can vary wildly depending on the requirements. All glazed extensions significantly increase the real ground floor living space, creating a real ‘Wow’ Factor to your home. Our clients say their glazed extension serves as a focal point for their family and (not surprisingly) is one area of the home where a significant amount of time is usually spent. 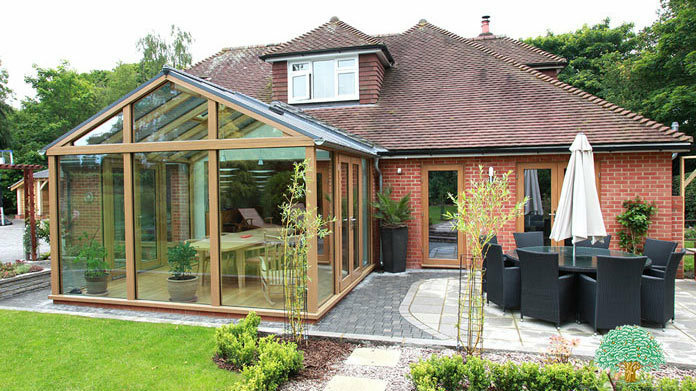 The kind of material you choose for your glazed extension is very important, because it can make a huge difference to the look, feel and cost of your project. There are three kinds of materials most commonly used when building extensions. These are uPVC, aluminium and Oak. A uPVC conservatory (or PVCu) is the lowest cost and comes in many different frame sections, wood grain effects and colours. It’s sometimes misleadingly described as a 'timber alternative' to infer that it is not 'just PVC'. Excluding building work costs, a good quality PVC conservatory will cost approximately half the amount of a typical hardwood conservatory. 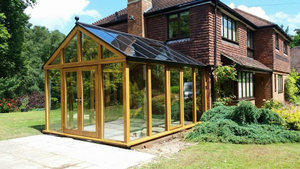 Aluminium conservatories are more expensive. 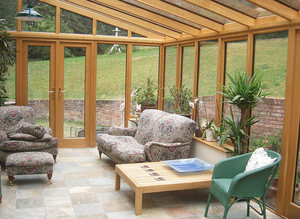 Frames can be provided in almost any colour and priced somewhere between PVC and as much as hardwood conservatories. 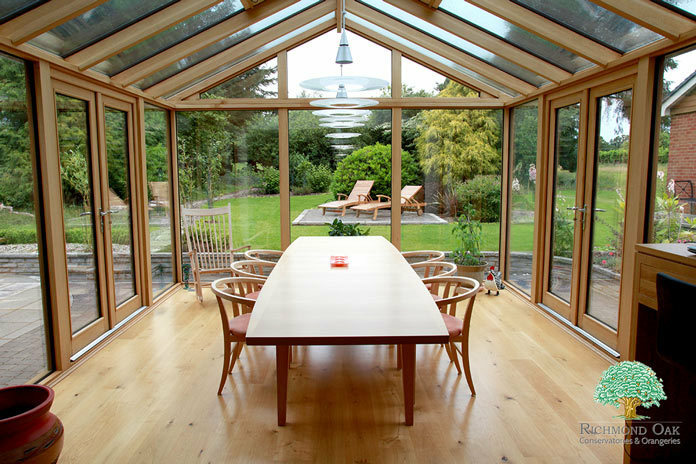 Wooden or timber conservatories are the most expensive, and can come in various types and categories depending on the kind of wood being used to build them. Softwood is by far the cheapest - the most commonly used being 'European Redwood' which is the posh name for 'Pine', and also 'Siberian Larch'. Unless you ask, you may be led to believe that these materials are hardwood. Softwood is cheaper in price, because it grows much faster than hardwoods. 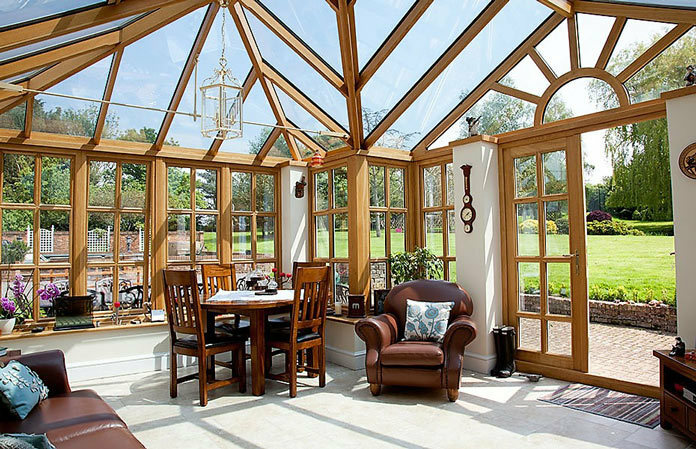 Every year Richmond Oak replaces many softwood conservatories as little as 7-15 years old due to wear, tear and weather damage. This is one of the primary reasons we don’t offer softwood. Yes, it’s cheaper to purchase, but has a shorter lifespan than a good quality hardwood. Hardwood is more durable and lasts much longer than softwood. However, not all hardwoods are the same. Even among hardwoods, there can be significant differences in the durability of the different timbers. For instance, Philippine mahogany is a common name for several different species of trees (https://www.wood-database.com/philippine-mahogany/) and is not actually a mahogany at all. Instead, it’s from the Meranti species and is on the ‘Critically Endangered’ list. It’s not clear whether any conservation measures exist for this species, but despite this, you should be aware that Meranti has little durability for outdoor projects. The most common hardwoods in use for glazed extensions include Sapele, Iroko, Idigbo and Oak. Oak is unique in that there are different categories of oak such as Green Oak, Air Dried Oak and Fully Seasoned Oak. You can learn more about the differences between these categories in a previous article I wrote HERE. Richmond Oak only uses superior quality fully Seasoned Oak. 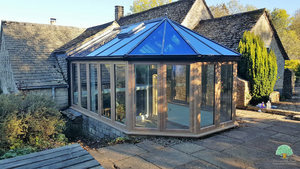 Where cost is a factor, or a glazed extension is to be fully painted (showing no natural timber), then more budget friendly options include Idigbo or Sapele. Another consideration to make is whether you’re looking to have a conservatory, an orangery, or a garden room. The kind of extension you’re looking for will also impact the price. This is because there are many differences in the design and specifications of each type of glass extension. 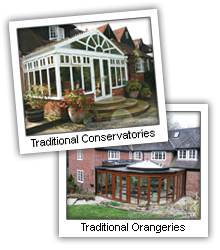 For example, an orangery can have a flat roof with a lantern or it can have a tiled verge with a lantern on top of the raised roof - frequently and incorrectly called a mansard orangery. Therefore, each kind of glazed extension has its own unique differences that will determine the end costing. It’s super important to ensure you fully understand the nuances and differences between the various materials so you can confidently make a good buying decision. 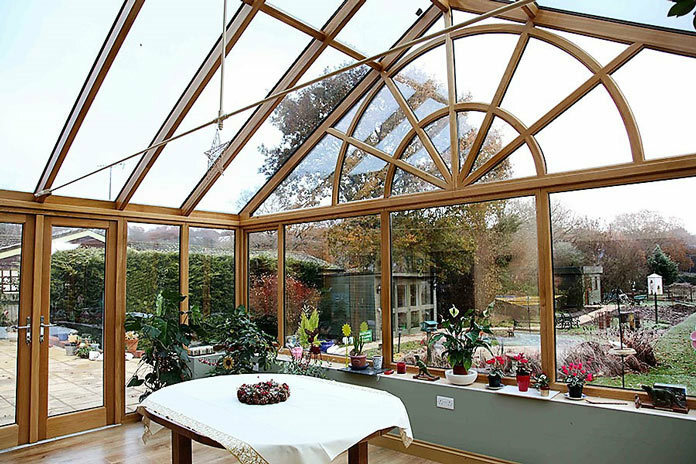 Nowadays, a conservatory or glazed extension is no longer a place for growing plants, but is a true living space. In many cases, it’s an open plan extension to a home. Therefore, it’s essential the temperature within the new extension is comfortable all the year around. You can read more about temperature differences and conservatory glazing HERE. 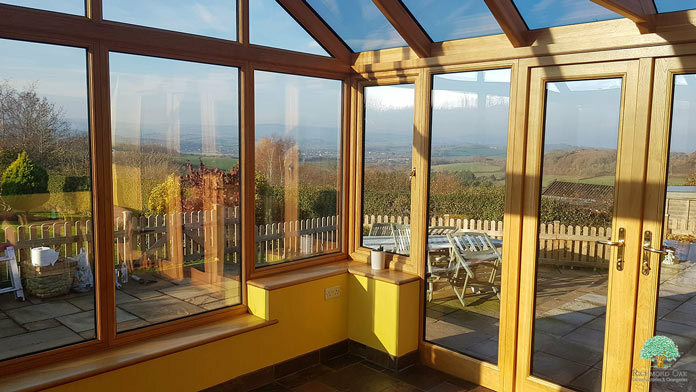 Understanding the impact of the glazing itself will ensure your new extension is not too hot in the summer and not too cold in the winter. Plus, unless the work is being carried out 'subject to building regulations', you should be aware there are absolutely no regulations covering the efficiency of glass in an exempt building. All glass must comply with the Building Regulations Document ‘L’ with respect to safety glass. However, even if the work is subject to Building Regulations, they are minimum standards and don't cover things like solar control glass. Before the introduction of solar control glass in 2000, there was little choice such as polycarbonate glazing in the roof. However, even with the glazed extensions built since then, I’ve found the majority of conservatories I’ve visited have low spec. glass and a lack of adequate ventilation. The legal term here would be "Not Fit for Purpose". As a result, we constantly get enquiries to 'change the glass, and add 'opening vents' to the roof or just to take it down and replace it. a) If your proposed extension is South or West facing, Solar Control Glass should be considered for both the roof AND the vertical frames. The best roof glass available can reflect up to 83% of the Sun's heat and clear solar control glass, up to 58%. b) If you want the room to be efficient in keeping the heat in on a cold day I would recommend double-glazed roof glass with an insulation value of 0.9. This is 6 times more efficient than single glazing and 25% more efficient than most conservatory glass currently available. We even specify clear solar control glass in north facing frames, not to keep the heat out, but because with an insulation value of 1.0, it’s typically at least 17% more efficient than non-solar glass. As a side note, please don’t get sucked into the hype around triple glazing. We’ve personally found that triple glazing offers minimal insulation benefits in comparison to the additional cost (usually 75% more costly than double glazing). Also, the necessary overall unit thickness of 44mm means your timber frames have to bear additional weight. For the price you’re paying, it’s simply NOT worth the extra expense. Unless the roof of your glazed extension is North or East facing in the shadow of the building, it's essential to incorporate roof ventilation. Warm air rises, so it can then exit the roof vent and create a welcome draught on a hot day. This is of course assuming you have suitable large opening windows and not silly fanlight openings at head height. Roof vents can be manual but most of our clients pay extra to have automatic opening roof vents with climate control and a rain sensor. a) In general, the more complex the design of a product, the more time it takes to manufacture and install, and therefore, the more it will cost. b) If the new work is in a corner, it may only have two sides to construct instead of three, reducing the cost. However, cutting into low-eave roofs or the requirement for structural box gutters may negate the initial cost saving. c) The larger it is, the more it will cost. Although, the larger it becomes, usually the lower the price per sq.m of building size. However, this may not apply if the building is very large, as this may require special structural work, calculated by a structural engineer. d) The frame design might have direct glazed frames, typical of modern casement windows on houses. This is where the glass is glazed into the outer frames. Or, for aesthetic reasons, fixed panes may be glazed into dummy sashes. This approximately doubles the cost of the timber frames because there are two sections of timber around each pane of glass. Please be aware that this may be a necessary requirement when carrying out work on Listed Properties. e) The more complex the design of a roof, the more it will cost. The least costly is a single pitch roof, typically termed a lean-to. When you move into designs with multiple facets or 'T' shapes with hips, valleys and/or gables, then the cost of a roof can double. Sloping sites and trees within 14m of the new work will usually add significantly to the building work cost, before the erection of the frames takes place. We can make assumptions about the location of your new extension, such as being on a level site, where the house floor level is within 30cm (4 brick courses) of the ground. Another huge factor in the pricing of your new extension is labour and installation costs. For example, rafters are machined along their length and then a joint is cut at both ends. It then goes through a paint finishing process, gets wrapped, shipped and delivered to site. It is then un-wrapped and fitted to the roof at both ends. The same process applies if the rafter is 1m long or 4m long, the only difference being the material cost. This principle applies to almost every part of a conservatory. Therefore, making a conservatory deeper or wider may not take any longer to manufacture or fit, but it will have more material content. The same applies to the groundwork. Assuming a flat, level site, most footings can be excavated in a day - whether the size is 3m x 3m or 8m x 4m. Once the task is completed, there will be nothing more for the builders to do that day. Concrete is usually poured the following day, after which the builders will leave so it can set. Regardless of whether you’re having a small porch built or a large extension, the process is the same. 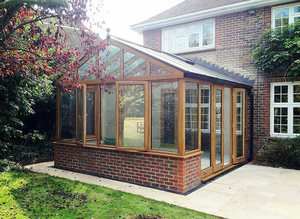 The guide price at the time of writing is that the building work for a conservatory (assuming a flat site), including foundations, insulated base, brickwork, underfloor heating, floor tiling, all to building regulations standards and including VAT is likely to be between £800 and £1100 per sq.m. 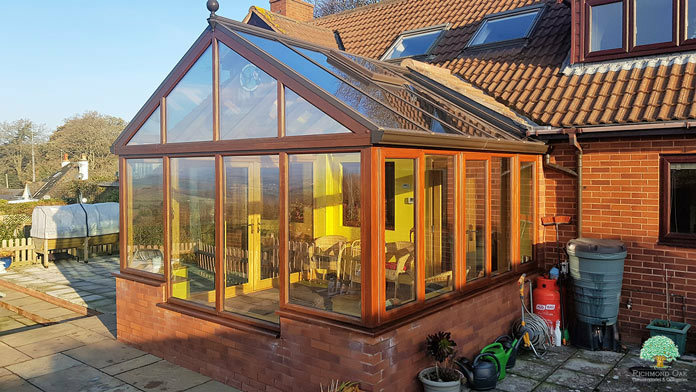 Conservatories with a glazed roof, with a high specification solar control glazing, adequate frame and roof vents, are likely to be between £2200 and £3500 per sq.m. depending on the type of timber used and the complexity of design and specifications. Similarly, Orangeries which frequently have more complex frame designs, will need structural beams to support the roof lantern. This means more work and materials are required to construct the roof. This typically costs approximately £500 a sq.m. more than a conservatory. 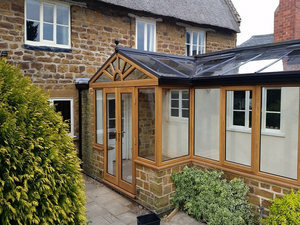 Garden rooms have a vaulted ceiling, an insulated tiled or slate roof and its cost depends on whether it has an exposed oak rafter or just a plain plastered vaulted ceiling. 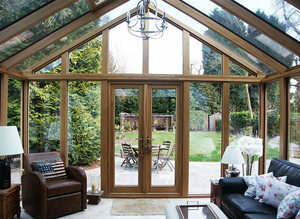 The price therefore usually sits somewhere between that of a glazed roof and an orangery. 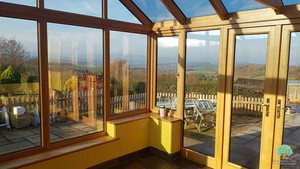 I hope this post has helped you to understand why it’s difficult to answer the question ‘What does a hardwood conservatory cost.’ Unless the new glazed extension is being installed onto an existing base, it’s unlikely you’ll be able to purchase a wooden conservatory with suitable specifications for less than £50,000. 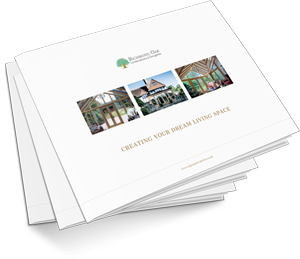 They only way to find the true cost is to have a free design and site consultation, discuss possibilities and obtain a fully detailed proposal to meet your specific requirements.